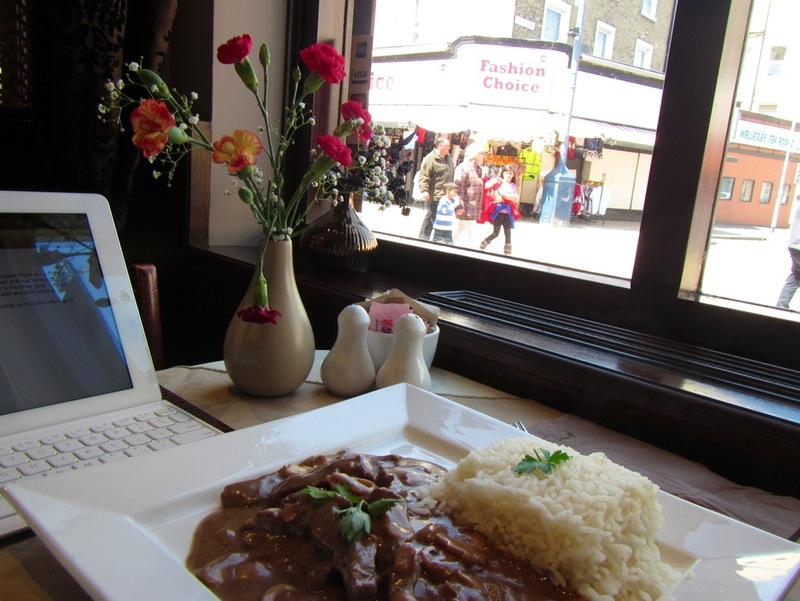 I sit at inside a restaurant watching the people stroll by on Regent Road as I wait for my lunch. 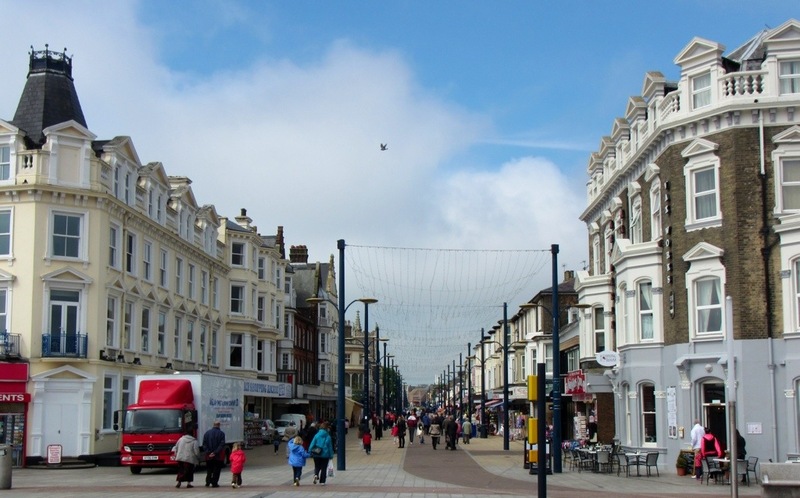 Regent Road is a pedestrian thoroughfare in the heart of Great Yarmouth, leading from the seaside Britannia Pier and Theatre nearly to the River Yare. To get to the river one just needs to continue beyond Regent through the Victoria Arcade and a bit beyond. The feeling on this road is of wandering through a flea market, such are the offerings of discount clothing, bric-a-brac, dress-up clothes, accessories, and specialty shops. Mixed-in with the retail are an assortment of restaurants, pubs, and coffee shops that apparently compete mostly by price. Large price boards highlight the best deals and cheapest coffee. One thing I notice about the passers-by, there are a lot of wheels with them. Baby carriages and wheel chairs, more than I have noticed other places up to now. 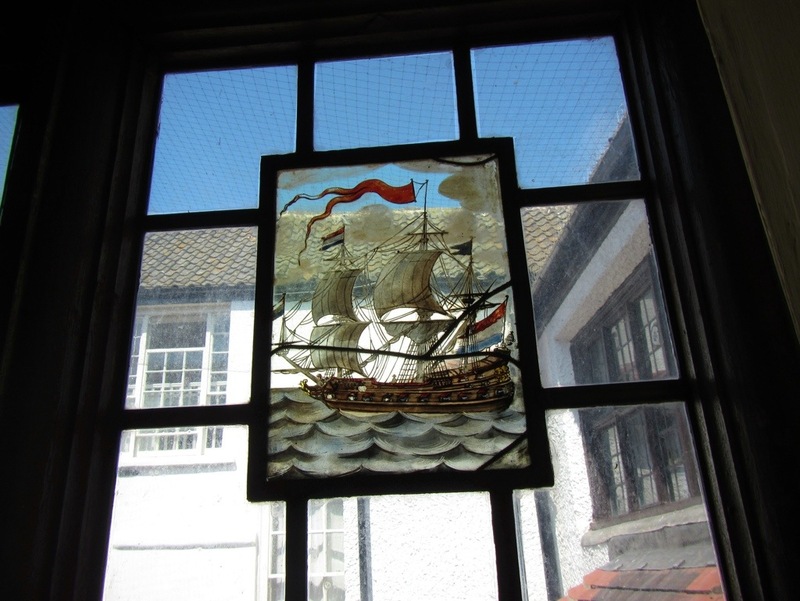 Along the River Yare I happen into Elizabethan House, an original home showing it’s more than 400 years of history. Here I enjoy the company of an amicable host guide, a woman in her 50’s, as well as an audio guide. During my visit there are at most 3 other visitors, so the guide happens by to see if I have any questions quite often, and I usually do. 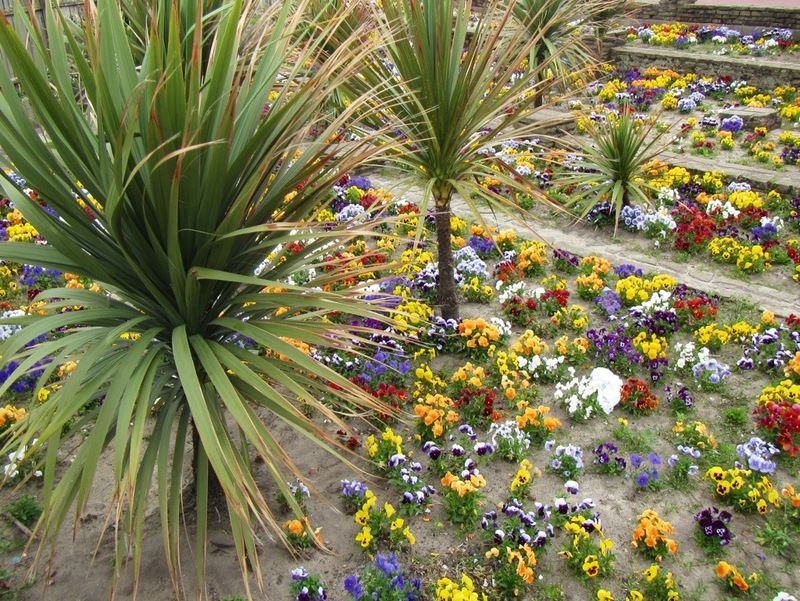 “The locals call this town Yarmouth, but officially it is Great Yarmouth. What makes it great?” There must be an explanation, since we don’t have Great London or Great Brighton. “Yarmouth was essentially on both sides of the River Yare (at the mouth of the river, I notice) and since it was quite separated by the water, they referred to the largest side as Great Yarmouth and the other side would have been Little Yarmouth.” I am reminded of Great Britain and the tv skit show Little Britain. Not exactly related to the Elizabethan Home, but she is more than happy to answer, I can tell that she enjoys being helpful. 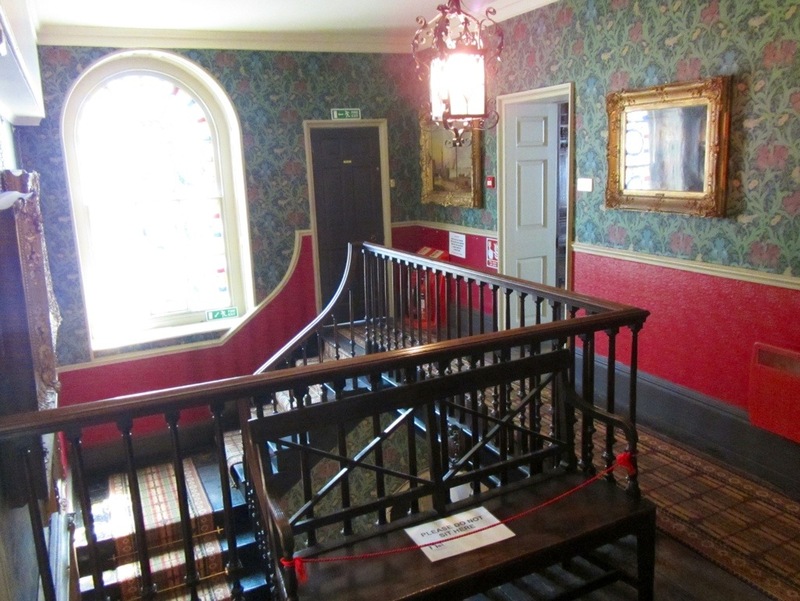 My next question is on topic, I wonder, “The enormous fireplaces demonstrate the family’s wealth, but why? Is it so very expensive to have large fireplaces built?” The ones here do look outsized for the rooms they are in, more so than others I can remember. 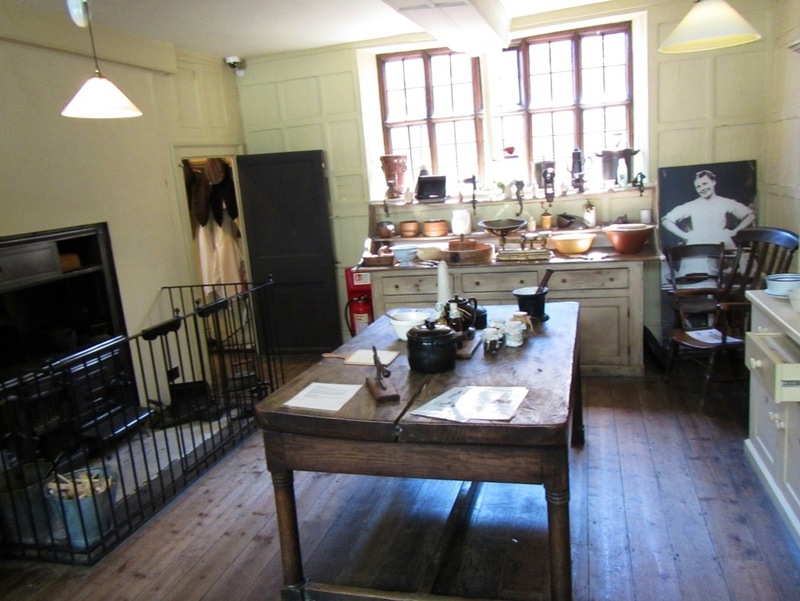 The kitchen is set-up as it would have been during Victorian times, probably more interesting to look at than earlier times as the Victorians had a lot more interesting gadgets. A balance scale for measuring, mince grinder and sausage maker, a hand-pumped vacuum; that kind of thing. In a bed chamber she tells me how the Victorians had a mistrust of sunlight and fresh air as I ask about the very heavily draped poster bed. 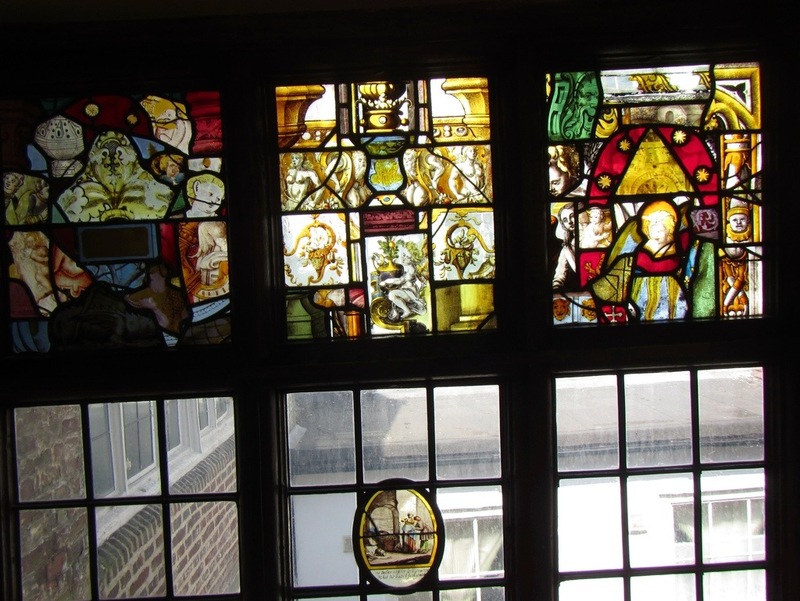 “The lady of the household would retreat into her room for as many as 6 weeks in advance of her pregnancy where she’d stay in bed and the drapes would be mostly closed. Perhaps they thought of it like a womb.” Can you imagine, anyone would need to recover from 6 weeks of being in bed, in any condition! Incredible. In a children’s playroom there is a lovely display of a miniature tea party. 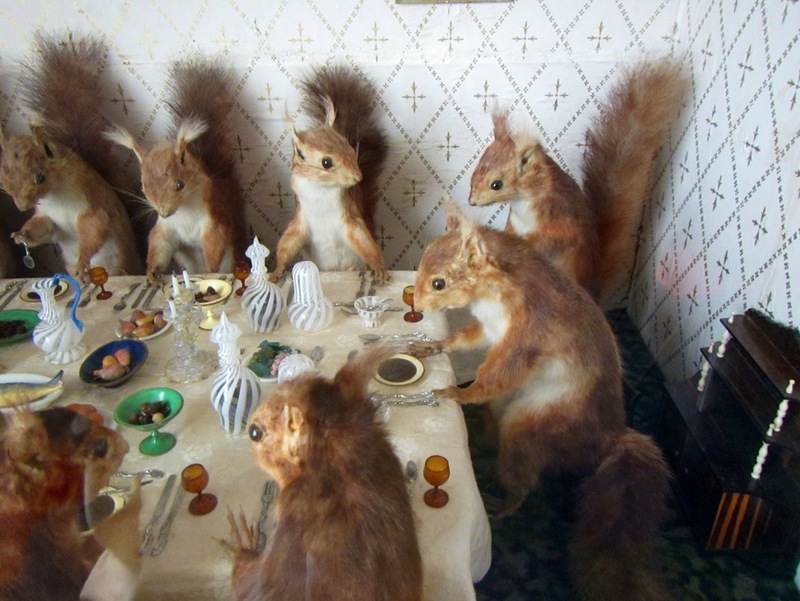 Except, instead of dolls sitting at the miniature table, they have 15 taxidermy squirrels. I suppose it might have been seen as cute, but it’s really creepy! 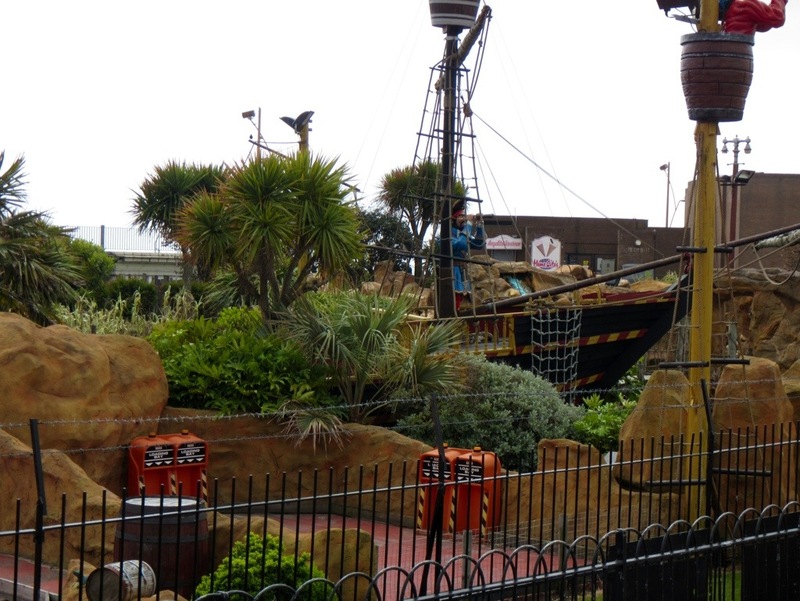 I ask about the fact that I am nearly alone visiting the museum and my guide tells me that Great Yarmouth has seen a decline over the years. With super cheap flights here and throughout continental Europe, one can spend a week in sunny Spain cheaper than they could in Great Yarmouth, it’s impossible to compete. “Perhaps that’s why the young (in carriages), the old, and the disabled make an unusual percentage of the visitors here,” I suggest, “people for whom it is difficult to travel very far are more likely to continue taking holidays here.” “I hadn’t thought of that,” she replies, “it could be.” But she wouldn’t see them in at this museum, it’s off the beaten path and Elizabethan homes don’t generally have elevators. 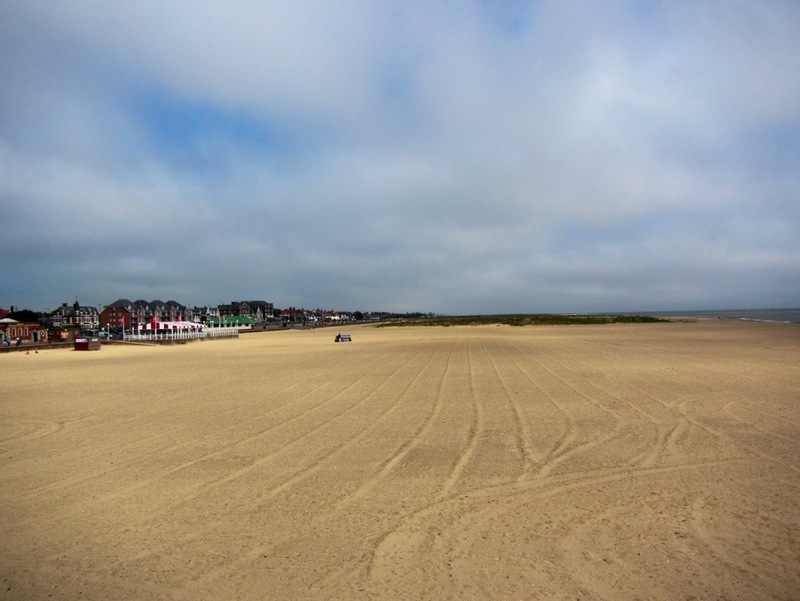 The very wide beach at Great Yarmouth has lots of space for no one to be crowded. 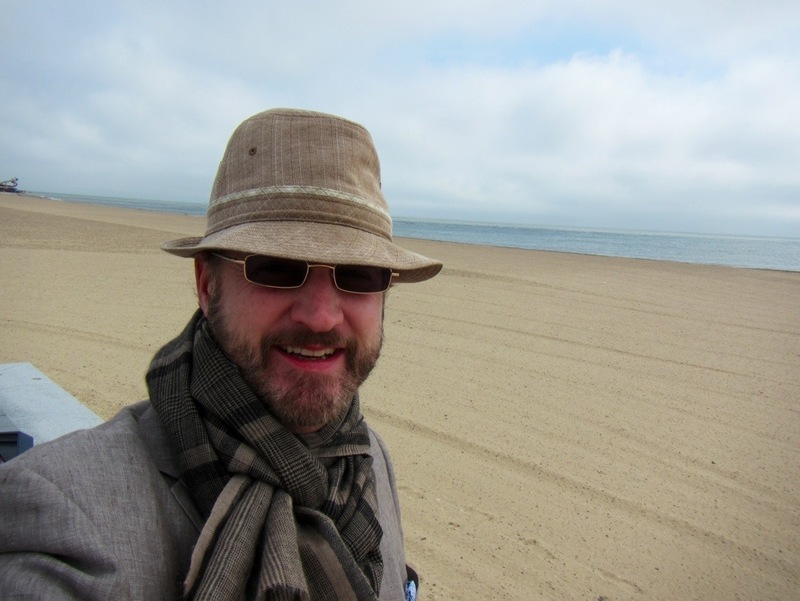 Don’t be fooled by my needing a scarf and hat, this is summer! In some ways this is a tacky seaside resort town, but in other ways Great Yarmouth is quite handsome. Doesn’t seeing palm trees make one feel tropical. Just for your perspective, however, the tallest of these came above my waist. 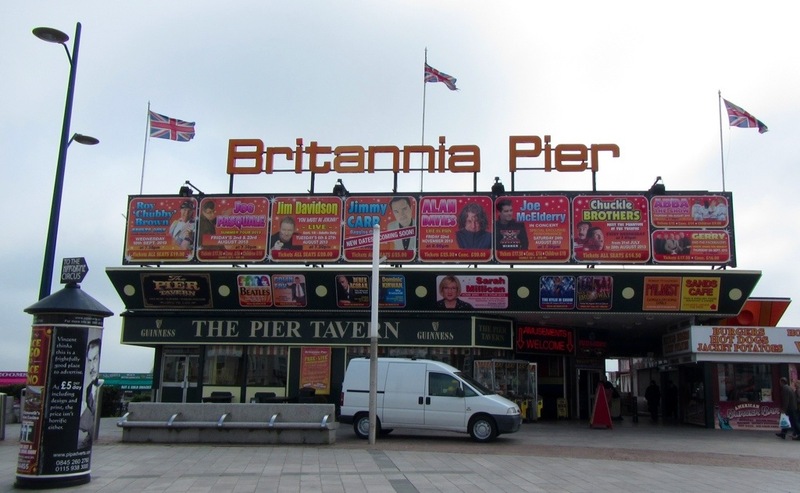 Britannia Pier is the main pier and houses restaurants, snacks, games, and more. 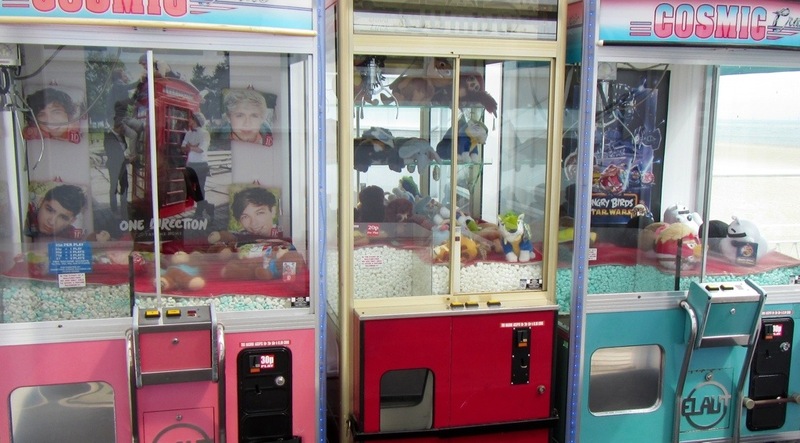 Not a real feeling of prosperity looking at the prizes available in these games. The views were the best thing about Britannia Pier. I didn’t stay late enough to see the fairy lights lit-up over Regent Street. There some games places thrown in to the mix. This handsome drawing room with a generous fireplace. 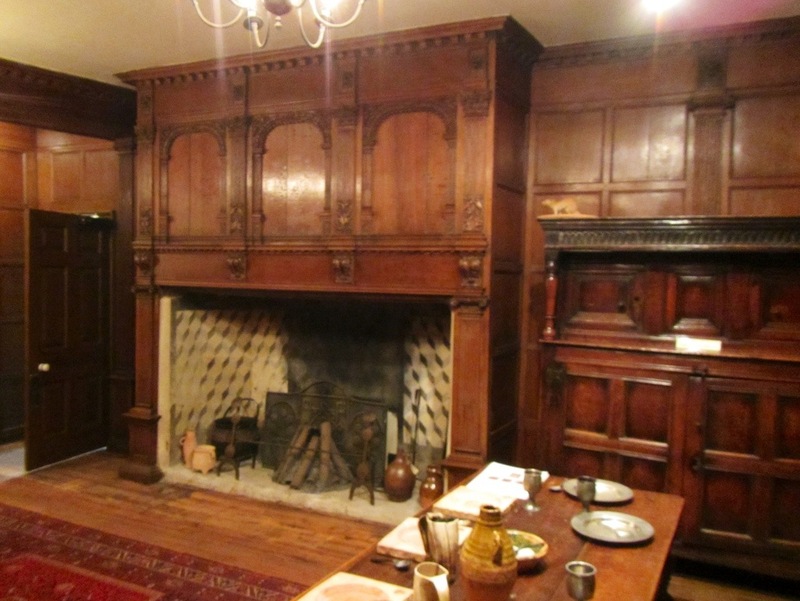 Remember that fireplaces were new in the 1500s, before we used fire pits in the middle of smokey rooms. 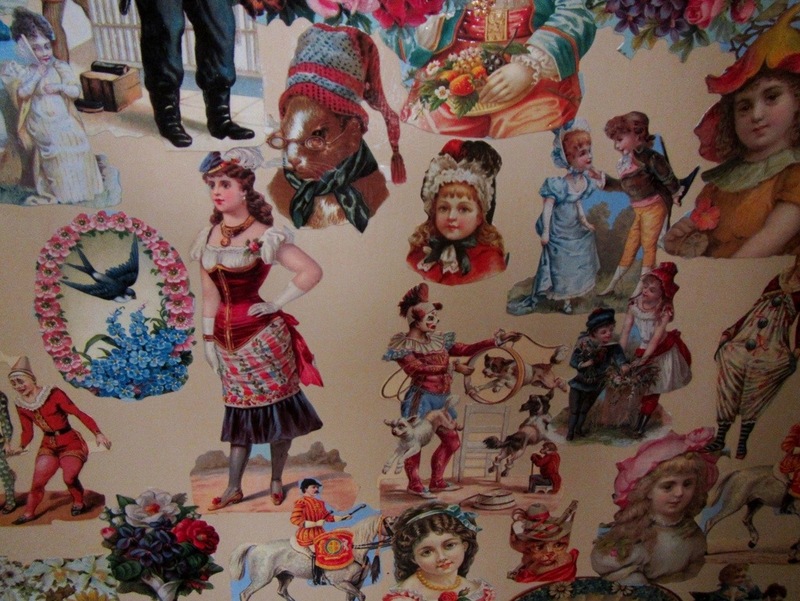 The basement-level kitchen has been done Victorian so visitors can enjoy all the fun Victorian inventions. I can’t decide whether this is cute or disgusting. 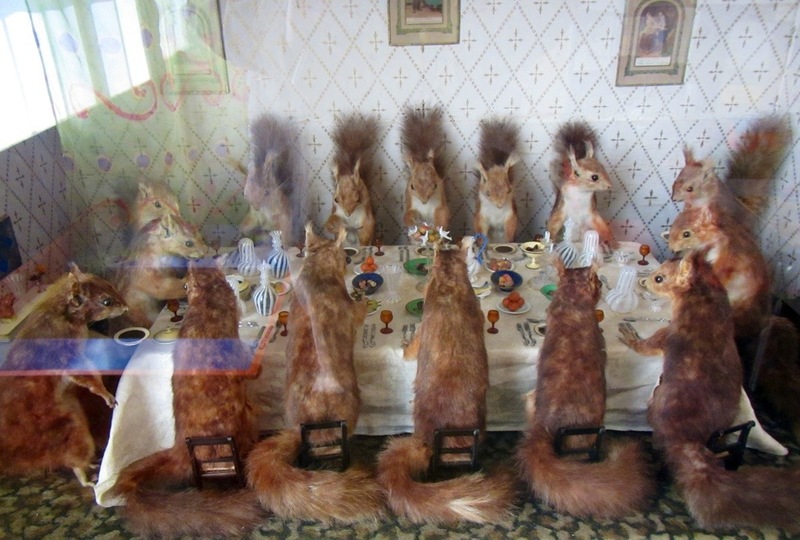 Fifteen taxidermy squirrels sat to dinner in the children’s play room. Would they have played with the little dead squirrels, or just looked at them? 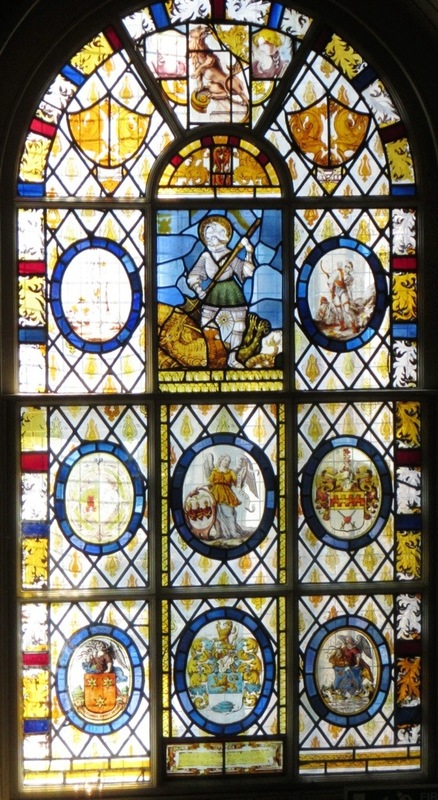 I forgot to ask but I suspect the glass here was put together from broken church windows, probably destroyed during the reformation. Regent street is much busier in the afternoon but I do find myself alone in this restaurant overlooking the pedestrian walk. 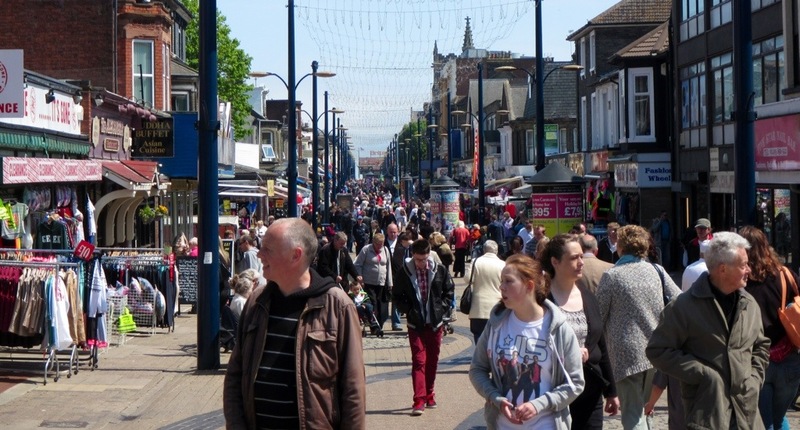 Lots of afternoon visitors along the high street. 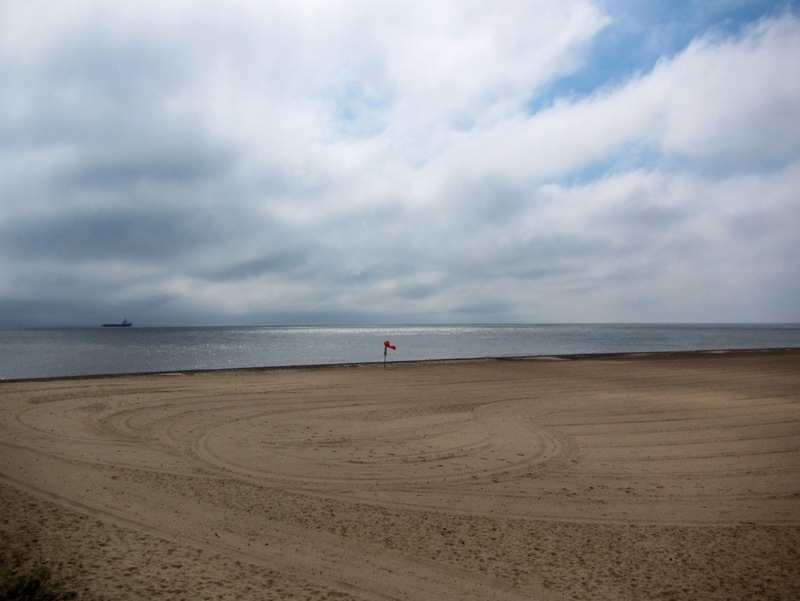 Some random photos around Great Yarmouth. I’m glad I visited this seaside town. 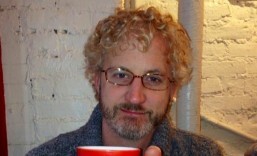 It’s decline is apparent, but I hope it survives. 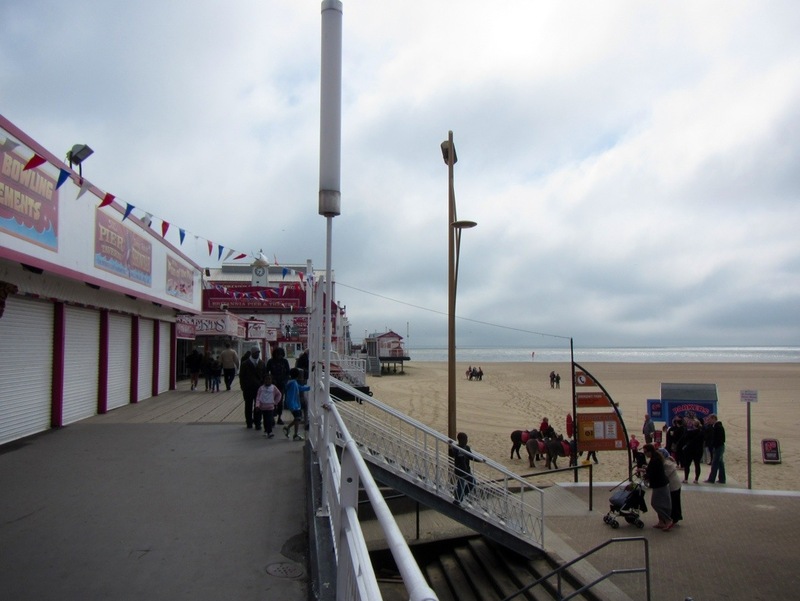 English seaside resorts are to me quite odd, I think it is due to the fact that a visitor could never count on the weather being warm enough to swim so there needs to be lots of other attractions. 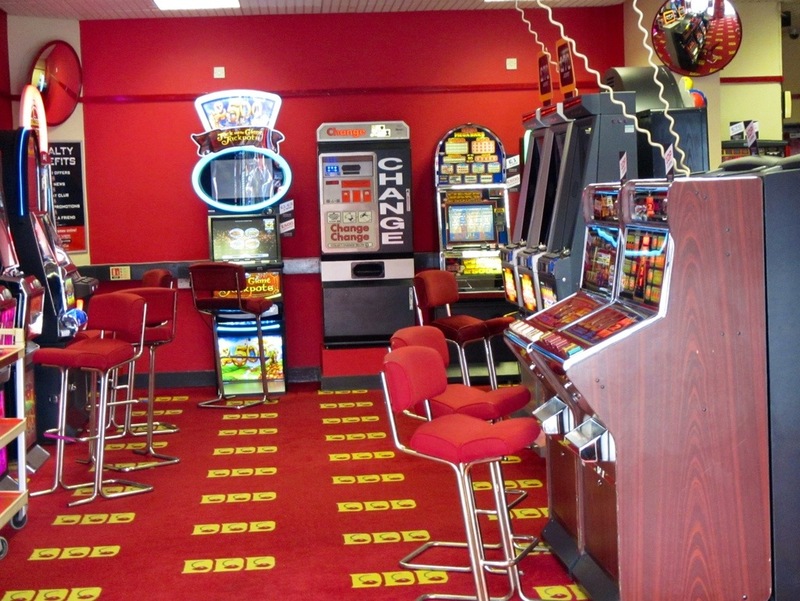 Carnival-like rides, casino slot machines, bowling alleys, cinemas, video arcades, amusement parks, and lots of discount shops say nothing of being near the sea to my experience, but they seem to be iconic seaside features in Great Britain.